For the second challenge we were assigned the mantra swirl. There are several ways of doing this swirl with the modified version being the easiest to cut so I chose to try that one. The challenge proved to be even more difficult for me than the peacock swirl however I am not going to post all my failures. The problem was mostly that my soap became too thick too quickly. I finally got one to allow me enough time to work by adding a little more water to my recipe. 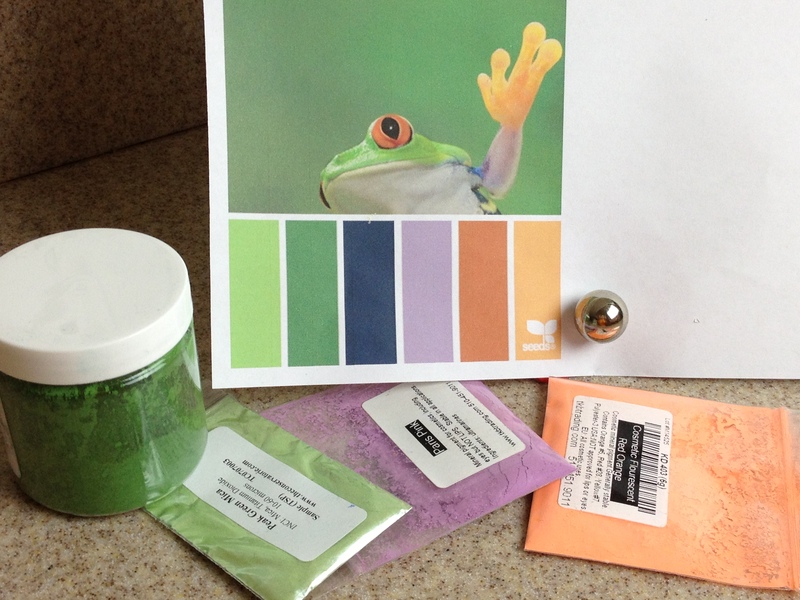 The colors I chose were based on a Design Seed pallet with a cute green and orange frog. I used Crafter’s Choice Ginger Orange FO from Wholesale Supplies Plus. I think I will name the soap Kermit. The swirl on the inside of the soap didn’t turn out quite like I envisioned but on a positive note I did get the colors I wanted. Once again I had a lot of fun trying something that I had not done before. I used different colors for each of the failed soaps so I got to try out a lot of the samples I ordered from TKB and The Conservatory. And thank you Amy for putting together another “challenge”. 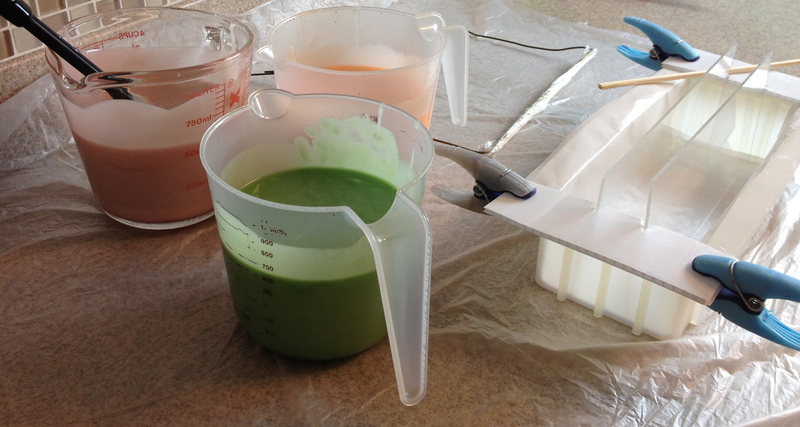 OBTW: I know you are not supposed to have to line silicone molds but this particular one gives me fits so I line it. I used this mold because the little side flaps made it easier to anchor the dividers. 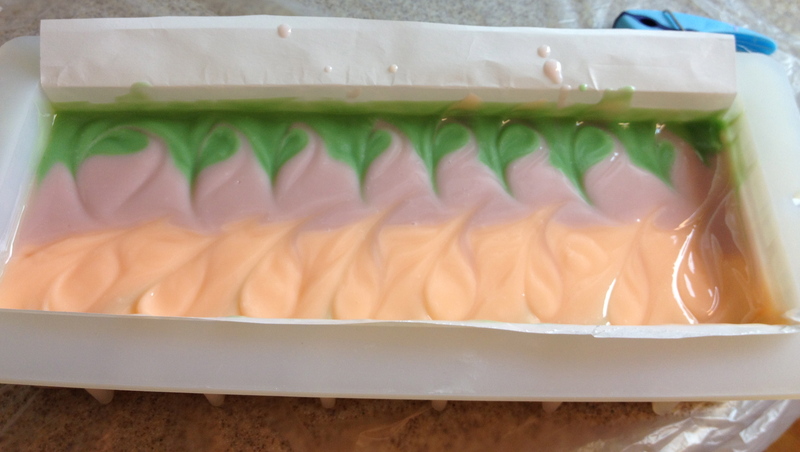 The colors are so delicate, love your Kermit soap! I love the design seed colors too. 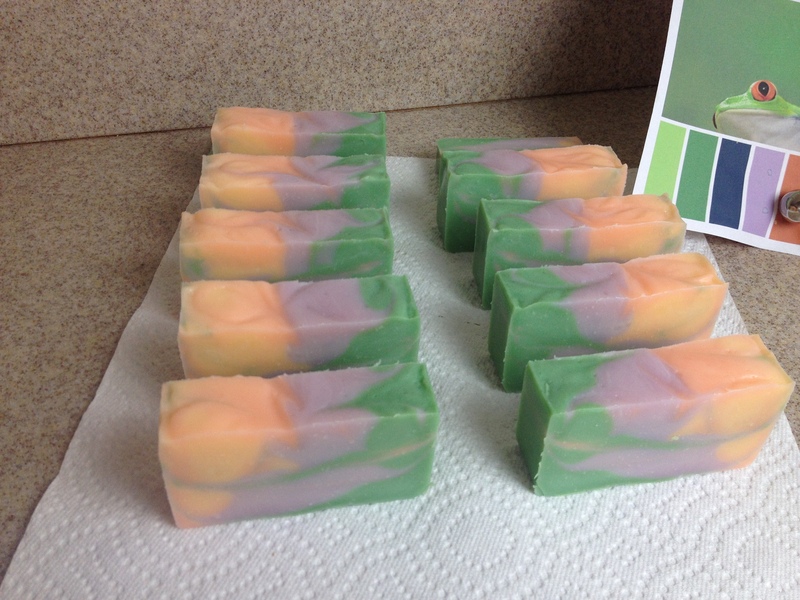 Great name for your soap and your colors turned out really nice! Cris – thank you for viewing and your encouragement. Beautiful mantra swirl! Love the peach color. Great job! I will have try design seeds. What a great way to get inspired! Thanks Stacey. I find it well worth the time to browse through the Design Seeds site for ideas. Aw, Kermit! Too cute! So glad you got your recipe to behave! It turned out great! !